If you decide to go with a luxury car as your next vehicle, buying a pre-owned model is easily the smartest decision to make. You can get all the fantastic features that come with luxury vehicles without having to pay full price. It means comfortable and convenient day-to-day driving without breaking the bank. If you are looking to purchase a used luxury vehicle, Certified Autoplex is here to help you by highlighting the various vehicles we have in our inventory. Here, we will be providing details on the Infiniti Q50 sedan. As the luxury off-shoot of Nissan, Infiniti vehicles are known for having all the safety and reliability of Nissan vehicles, on top of a ton of great luxury features, all for a reasonable price. Continue reading to see some of the great features that make up the Infiniti Q50. 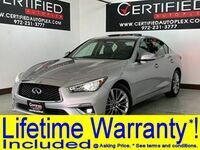 If you are in the Dallas TX area and are considering a used Infiniti Q50, follow this link to our inventory. We currently have just one available model of the Infiniti Q50 sedan, which is from the 2016 model year. Despite being the most cost-efficient Infiniti vehicle available on the market, it still has a wide range of impressive features that drivers will love. In terms of vehicle performance, the Infiniti Q50 is an incredibly sporty sedan that is a blast to drive. The engine in the Q50 generates up to 208 horsepower and 258 lb-ft of torque, which is fantastic for a vehicle this size. Combine this with a 7-speed Tiptronic automatic transmission, electronic stability, double wishbone front suspension and more, and the Q50 gives you full control of the vehicle. The Infiniti Q50 absolutely prioritizes interior comfort to make sure that day-to-day driving becomes that much easier. First, the Infiniti Q50 can comfortably seat 5 passengers, including 44.5" of front legroom and 35.1" of rear legroom. Other great interior comfort features include things like 8-way power front seat direction control, dual zone front automatic temperature control and much more. In terms of technological features, the Infiniti Q50 has a ton of cutting-edge technologies that drivers will undoubtedly use on a regular basis. Some of these great technological features include satellite radio, Bluetooth compatibility, two 12V DC power outlets. Intelligent key USB ports, remote keyless entry and more. 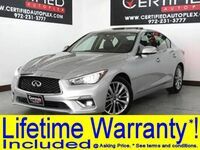 Interested in a Infiniti Q50?